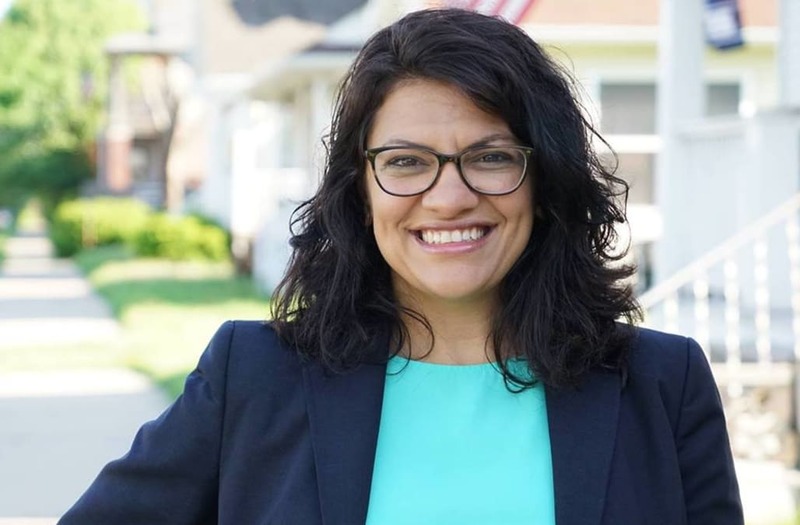 Rashida Tlaib won the Democratic Party nomination for the US House of Representatives in Michigan. She will run unopposed in November's special elections, putting her on course to become the first Muslim woman in Congress ever. The 42-year-old is an outspoken critic of Donald Trump, having been forcibly removed for heckling him at a luncheon two years ago. The Detroit-born daughter Palestinian immigrants has also spoken about the difficulties of being a Muslim in Trump's America. Rashida Tlaib won the Democratic nomination for the House in Michigan's 13th District, putting her on track to become the first Muslim congresswoman in US history. She will run unopposed in November's special elections as the Republican Party has not put forward any candidate to contest the seat. Tlaib is poised to take the former seat of John Conyers, the Democratic congressman who left his seat last December following multiple sexual harassment allegations. Conyers had been in Congress representing various Michigan districts since 1965. In this Nov. 6, 2008 file photo, Rashida Tlaib, a Democrat, is photographed outside the Michigan Capitol in Lansing, Mich. The Michigan primary victory of Tlaib, who is expected to become the first Muslim woman and Palestinian-American to serve in the U.S. Congress, is rippling across the Middle East. In the West Bank village where Tlaib’s mother was born, residents are greeting the news with a mixture of pride and hope that she will take on a U.S. administration widely seen as hostile to the Palestinian cause. No number of opponent signs can wipe our smiles of hope. So Yousif came with me to one of our senior luncheons and we met Mother Williams who turned 104 years old (MashAllah). Yousif turns to me and says, "I thought you died at 100." Everyone laughed. I love being with the people I will fight and serve in Congress. Tlaib had won 33.2% of the votes as of Wednesday morning, The New York Times reported with 96% of the votes being counted. The first runner-up, Brenda Jones, trails her by more than 3,000 votes. The 42-year-old progressive candidate, who was born in Detroit to Palestinian immigrants, isn't new to politics. She was a member of Michigan's State House of Representatives from 2008 to 2014, until she hit her term limit. She then worked as an attorney at the Sugar Law Center for Economic and Social Justice, which fights for employees rights. Tlaib has been particularly vocal in her opposition to Donald Trump. Two years ago she was forcibly removed from a ticketed luncheon in Detroit after heckling then-Republican nominee Trump, who was giving a speech on economics at the time. She had shouted, according to the Detroit Free Press: "He doesn't love Detroit. He doesn't love no one who isn't Donald Trump," before being dragged away to a mixture of boos and applause. She later said she had been protesting Trump's attitudes toward immigrants and Muslims. "I have heard critics calling it unbecoming of a former state legislator," she wrote in the Detroit Free Press. "Well, I believe it is unbecoming of any American to not stand up to Trump’s hate-filled rhetoric and tactics." Watch Tlaib's protest in the first 35 seconds of the clip below. Tlaib is likely to continue her opposition to Trump when she takes her seat in Congress. In June, Tlaib protested the Supreme Court's decision to uphold Trump's controversial travel ban, and a local news report showed her breaking up a fight between a protester and a passer-by. She vowed to introduce legislation to repeal the decision upon her election, CNN reported. She has also hinted at impeaching Trump while in Congress. She told The Hill in April: "I keep telling people this is about electing a jury that will impeach him, and I make a heck of a juror." Tlaib's progressive campaign is similar to that of Alexandria Ocasio-Cortez, the 28-year-old socialist candidate for New York's 14th District who beat a veteran politician in a major upset to the Democratic Party earlier this year. Tlaib's campaign includes providing Medicare for all, securing a $15 state minimum wage, and fighting big corporations for worker and union rights. Her team took an "aggressive and direct" approach to campaigning, like Ocasio-Cortez, CNN cited her campaign manager as saying. Andy Goddeeris, Tlaib's campaign manager, told CNN: "We are basically running the same campaign, with the same platform and with a very similar candidate." Tlaib has privately agonized over the country's anti-Muslim sentiment, CNN said. She told the news network earlier this year that when her son saw a cartoon comparing Muslims to Nazis published on a US news platform, he reportedly told her: "Mama, don't worry, if anybody asks if I'm Muslim I will lie and tell them I'm not." Tlaib said: "I get emotional about it because the pressure of running as a Muslim for so many [Muslims] that I've been meeting, [they're] like, you have to win... It's very painful and so they say you gotta win, because if you win, then our kids will see that we belong." As the results trickled in on Wednesday morning, Tlaib tweeted: "Thank you so much for making this unbelievable moment possible. I am at a loss for words. I cannot wait to serve you in Congress."